Between BBQ catering, pop-up dinners and day jobs the Pork Ninjas compete in barbecue competitions all over North America. The current team is comprised of Jason Rees and Andrea Toole, food blogger, team sous chef & cornbread baker. The catering company was formed almost by accident. It began as a way to fund barbecue contests and at first Jason only catered for people he knew. Then friends and customers of those people began to call. Strangers hired him. A business was born. It was a fallen apple tree that began Jason Rees’s obsession for cooking with wood so many years ago. The passion for food cooked over that old apple tree lead to the creation of the award-winning Pork Ninjas Barbecue & Catering Team. Jason is a member of the Kansas City Barbecue Society and also a certified KCBS judge. His girlfriend/partner Andrea joined him during the 2012 season because not seeing him on weekends for several months sounded boring. She was instantly hooked. Check out her website, Finding Health & Wellness. 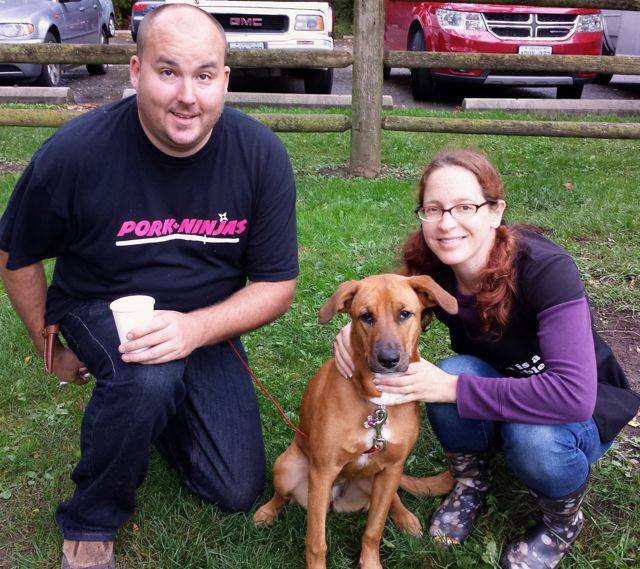 Bourbon the dog came into their lives in May 2013 and often accompanies them to catering jobs outside of Toronto. As a mutt of unconfirmed origin, the theory is that she’s a Scarberian Landscaping Dog or a Laserhound. She helps with clean up and security. Follow her on Instagram: bourbonbrowndog. “The seafood boil was a big hit – I’ve never seen so much seafood in my life, and I could tell that all my guests were quite impressed…To this day, I still laugh that Jason hunted us down and literally put food in our mouths so that we could relax for a few minutes and enjoy the event for what it was. Set up and clean up was efficient. The whole process was a joy. Thank you so, so much. I’m glad we went with you guys – it wouldn’t have been the same without you. I will ONLY recommend you to anyone looking for catering. -Corporate Client (law firm), June 2016.